← Phog’s Updated March Listings…WOW! Feels good when the community expresses, publicly, their appreciation for what we try to make happen at Phog Lounge. This was in The Windsor Star recently. Had to share. Thank you Doug Fox. 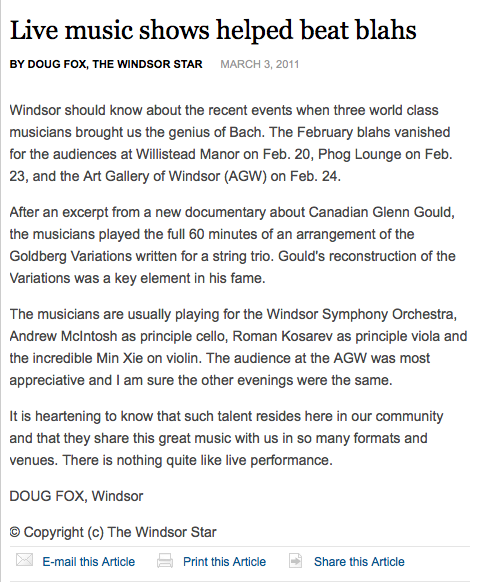 This entry was posted in Press and News and tagged Bach, Erik Ingalls, Glenn Gould, Gould on Goldberg, The Goldberg Variations, Windsor Star, Windsor Symphony. Bookmark the permalink.